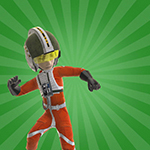 Rebel Legion :: View topic - Helmet Problems? Posted: Fri Jan 24, 2014 5:21 am Post subject: Helmet Problems? So if I wear my helmet where it's supposed to sit (I assume), all the weight of the helmet rests on my nose through the visor. I noticed in ESB Luke has some piece of padding on the visor but I can't get a clear screen shot. Does anyone have any other tips to combat this? Perhaps you could raise the visor up a little bit? Or add some extra padding to the inside of the helmet so it makes the helmet sit a bit higher on your head. I don't know if anybody has ever figured out what they used on screen, ROTJ Wedge has a black one, I believe others do too. What I did, was I used a bit of black door edging that was left over from the edges of the helmet. It doesn't always stay in place, but it works. The CV ESB eFX helmet has a thin rubber, tan/beige-sih appliance there at the nose. Doubtful you'd be able to source something similar though. Do you have the pad that came with the helmet to pad the top of the stand? You could try that. No you really shouldn't have a problem if you use a nose piece. The only thing that could potentially be an issue is if you're doing a face character. Even then, it really shouldn't be an issue. What James said. We'd rather have a bit of slight foam or trim there than someone's nose getting cut.